Planning your wedding will be one of the most wonderful – and also one of the most stressful – times in your life. Whether you want to be married in an elegant and traditional ceremony or prefer to host a more low-key celebration of your love, you can expect your event to cost a substantial portion of your income and also to occupy most of your waking time. The good news, though, is that you don’t have to go it alone. If you have a good wedding planner at the helm, he or she can help you through the turbulent course of your planning activities. Better yet, you can expect your wedding planner to help you manage the costs of your event and, in the ideal world, he or she will enable you and your partner to stay afloat and even hang on to some tenuous semblance of sanity as it gets closer to your big day. Wedding planners generally hold many roles, including that of surrogate parent, psychiatrist, stylist and legal consultant. The right person for the job needs to be a good fit for your personal taste and style, and at the same time, for all of the preferences and styles of your fiancé, your family, your wedding party and all of the vendors you will come into contact with throughout the course of your wedding planning and throughout the many related activities as well. This means that this one person must do it all, making you, and everyone else involved, happy. If this sounds like some very tall orders to fill, rest assured that there are many highly qualified wedding planners out there who can, indeed, do it all. The challenge, though, is finding the right one for you. You need to find someone who can communicate well with you, and vice versa, and who can understand your vision and help you make it happen within your timeframe and your budget. You may have to meet with a few, or even many, wedding planners to find the one who will best represent you, but chances are you will know the right person when you find him or her. When you interview wedding planners, some of the things you might look for include someone who is very organized and seems detail-oriented. 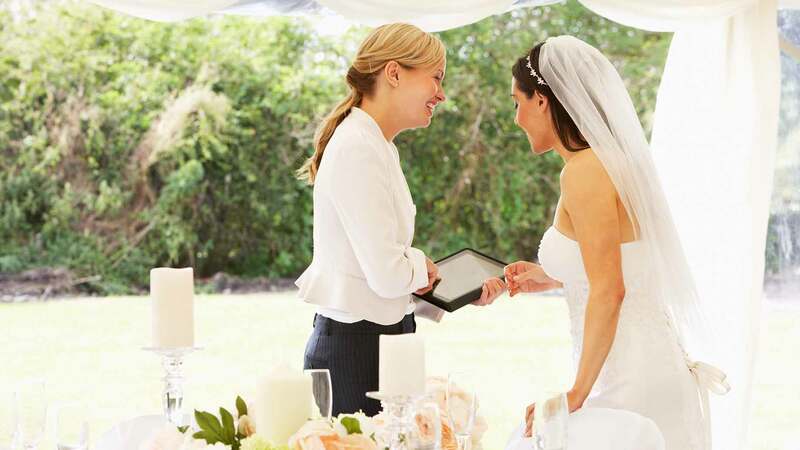 You should make sure your wedding planner has strong contacts with vendors in your area. In addition, try to find someone who has a creative bent, since you are sure to run into challenges in the time leading up to your big day, and you will need someone resourceful to help you get around them effectively. Finally, make sure your wedding planner is a good listener and will respond to your preferences and won’t try to impose his or her will on you. Don’t be afraid to ask wedding planners you are considering for references so you can talk to other couples and see how well the planner met their needs and followed through on tasks to plan a successful event. With so much hinging on the expertise of a wedding planner, you may wonder what you should expect to pay for his or her guidance. A lot depends on what you ask of your wedding planner, and how much, or how little, you will include this person in your activities. For instance, some couples want the wedding planner to do it all, from helping right from the beginning of the planning process through the managing of all of the many details and all the way through to the seeing the last guest off at the end of the wedding. Other couples already know what they want for their event, and where and how they want to have it, but just want a wedding planner’s expertise to help coordinate some of the details and make sure their plans come off smoothly. Finally, some brides and grooms choose to do everything themselves and want a planner to step in only for the big day to serve as a coordinator/general manager of the event itself. Therefore, the role that you ask your planner to play, as well as the amount of hours that will be devoted to your wedding and the level of experience that he or she brings to the task, will greatly influence the price you can expect to pay for the services rendered. New wedding planners may be willing to help you organize your entire wedding for a low fee, while very experienced planners can command very high rates for even just a few hours of advice. In addition, keep in mind that smaller weddings usually take less work, while weddings with a larger guest list or more out-of-town guests can take more work to coordinate smoothly, so the costs involved can be higher. Generally, you can expect that your wedding planner will charge between 10 and 20 percent of your overall wedding budget to work with you from start to finish. Keep in mind that this can vary greatly, however, based on the area of the country in which you live, how experienced and in demand your planner is, and also how exclusive your wedding will be. The average hourly rate for a wedding planner is between $50 and $150 an hour. A few things to keep in mind when negotiating a rate: If your wedding planner offers you a flat-fee package for working on your event, be sure to ask if this includes a limit on the number of hours that will be spent and, if so, what hourly rate you will be charged if you exceed this timeframe. (One wedding coordinator estimated that it can take 30 to 40 hours or more to coordinate the event; but again, this can vary widely, so ask what your vendor has in mind and don’t rely strictly on this estimate!) The reality is that the time a planner spends on your event may be more than you anticipated up front, and you want to avoid any unexpected bills at the end, so be sure to keep the lines of communication open throughout the process so everyone knows what to expect. Also, be wary of wedding planners who claim that their services are “free” but then book you with their own vendors and add in a kickback for their efforts. The truth is that few things are free today, especially not a good wedding consultant. So check with your local better business bureau and also with local and national associations of bridal vendors to be sure a wedding planner is reputable before signing any contracts or taking his or her advice. Further, if you find a wedding planner you really like but believe the price is a little out of your range, don’t be afraid to tell him or her what you can afford and find out what he or she can offer you for that money. It’s possible that the wedding planner may be able to give you the direction you need if you handle some of the details to minimize the time and work needed to be spent on the event. In addition, if it is a slow time of year in the wedding business, a wedding planner may just be willing to negotiate a little for the work. Finally, if you have your heart set on having the help of a wedding planner to guide you but aren’t sure you can find room in the budget for this expense, keep in mind that a good wedding planner will often pay for her- or himself in the cost savings you might realize. An experienced wedding planner has relationships with various wedding vendors, and as a result can negotiate much better rates than you could get yourself. This means that even on a tight budget, you may be able to afford a professional to help you plan the perfect event.